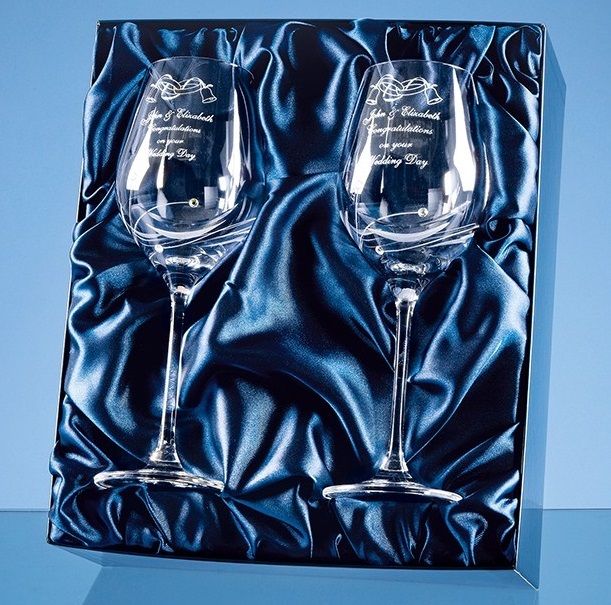 Set of 2 Engraved Wine Glasses with 3 Swarovski Crystals. The Diamante Crystal wine glass set would make an ideal engagement, wedding or anniversary gift. The set comprises of 2 lightly cut crystal wine glasses that have 3 Swarovski crystals bonded to the side of the glass. They are packed in a blue high quality gloss finish presentation box and can be engraved with any crest, logo or wording to create a gift that is sure to be treasured by the receipient.